1965 Le Maine Libre Le Mans Poster - Triumph Spitfire - Ferrari 365 P2. 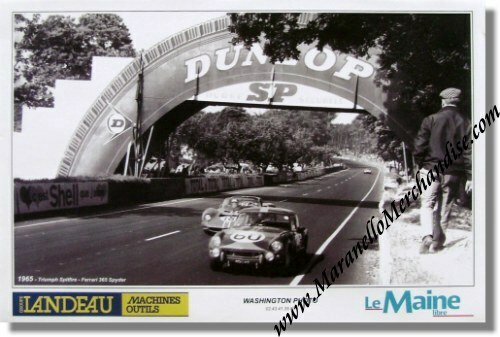 Issued by Le Maine Libre, a local Le Mans newspaper, in 2007 it shows the # 60 Triumph Spitfire of Jean-Jacques Thuner & Simo Lampinen (S/N FC 545 952, License Plate ADU 4B) about to be overtaken (under the Dunlop Bridge) by the # 18 Ferrari 365 365 P2 of Pedro rodriguez & Nino Vaccarella (S/N 0838). Both cars would finish the race... The Triumph in 13th spot with 274 laps, the Ferrari in 7th spot with 320 laps to its name.